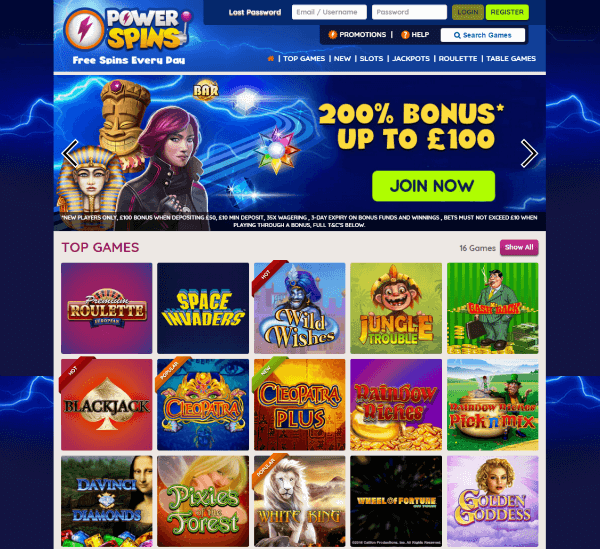 Power Spins is the latest casino established by the well-known company BGO Entertainment. What makes the gaming venue launched in 2017 stand out from the crowd is the casino bonus policy thanks to which its customers are given free spins on a daily basis. Power Spins Casino runs on a multiplatform providing players with high-quality casino games produced by some of the biggest names in the online gaming industry such as Playtech, NetEnt and IGT. Although its name refers to slot machines, at PowerSpins you can enjoy other casino games too. To access the gaming content you need no additional software as they are available in instant-play mode. The casino is licensed and regulated by the trustworthy gaming authorities which guarantee that it complies with the high industry standards and the UK regulations. You can make your payments to the casino via a range of convenient banking options without worries about the safety of your transactions. New customers will be offered the Power Spins Welcome Package consisting of 50 free spins no deposit required, a 200% match bonus up to $100 and 50 extra free spins over your each next deposit during 5 days. To claim the welcome bonus of up to $100 you need to make a deposit of at least $10 upon your registration. Customers will automatically receive 50 free spins when they create a real money account with no deposit required. Winnings from free spins are subject to the wagering requirements set at 35x. The first deposit bonus has 35x wagering requirements too and you have to redeem it within 3 days. If you opt for Neteller or Skrill as a preferred banking method, you will not be eligible to receive the 200% first deposit bonus and first 50 free spins. Check out the Terms and Conditions section to find out which games are excluded from wagering contribution. Whenever you wager real money at Power Spins Casino, you will notice that your bolt bar increases. For every bolt that you earn, you will be given an extra free spin whenever you make your first deposit of the day. The more you play, the more free spins you will unlock up to 100 every day. It’s up to you which games you will play and you need to make a minimum deposit of $10 to qualify for this promotion. As soon as you make your first deposit of the day, you will be asked to choose the Game Pack to receive your daily free spins. Power Spins Casino runs on the instant-play platform which means that you can access it directly from your internet browser and play the games with no download required. The games are classified into categories allowing you to easily search them and find ones to your liking without difficulty. The gambling site is fully optimized for mobile play and performs smoothly on Android and iOS powered smartphones and tablets letting you to take your favorite casino games with you wherever you go. More than 350 slot machines provided by the leading gaming companies will be at your fingertips once you register with Power Spins Casino. Out of this number, almost 100 titles deliver huge progressive jackpots which can make you a millionaire in a single spin. When it comes to video slots, at Power Spins you can take your chance on some of the most popular titles like Starburst and Guns N’ Roses from NetEnt or Balloonies from IGT. Progressive slots include titles like Mega Fortune from NetEnt, slot machines inspired by superheroes from the Marvel Series by Playtech and Cleopatra slot titles from IGT. The slot library is updated on a regular basis allowing you to enjoy the latest releases as they are rolled out on you desktop or mobile device. Don’t take the casino’s name too seriously as Power Spins offers even 16 Roulette variants along with a range of Blackjack variants including Progressive Blackjack, Baccarat and Casino Hold’em. When using the welcome bonus, keep in mind that table games contribute only 20% or less to the wagering requirements set by the casino. Players are allowed to choose from major credit and cards, e-wallets and prepaid cards to make their deposits. Visa, MasterCard, Skrill, Neteller and Paysafecard are among the brands supported by Power Spins Casino. The minimum deposit you can make is $10 while the minimum withdrawal is $20. You have to make withdrawals via the same method used for your payments and the casino allows you to clear up to $5,000 per day or up to $25,000 or $100,000 per week or month respectively. Gamblers looking for an online casino destination specialized for slot machines need look no further as Power Spins Casino may be a perfect fit for them. Not only that the gaming venue offers some of the most popular online slot titles in the world today, but they award you for your loyalty and the money spent on these games. If you are more into other forms of entertainment, you can enjoy them at the gambling site too and won’t left you disappointed. Operating under the licenses issued by the reliable authorities such as the Alderney Gambling Control Commission and the UK Gambling Commission, the casino provides players from all parts of the world with a fair and safe gaming experience. A pleasing to the eye appearance and straightforward layout will make your stay at the casino enjoyable so that you can relax and experience the real casino thrills while taking advantage of loads of free spins credited to your account on a daily basis.